Here's an obscure but fascinating footnote to the career of one of Hollywood's great soundtrack composers, Bernard Herrmann. Herrmann is most famous for his Alfred Hitchcock scores - those shrieking strings in "Psycho" are certainly among the most famous minutes in film soundtrack history. "This little-known suite of 11 short movements, totaling 25 minutes of music, displays Bernard Herrmann's versatility in making music dealing with the Strange. Bernard Herrmann (1911 - 1975), now a legend among film composers, got his start as a conductor-composer for CBS Radio in the 1930s. His Hollywood career began due to his work for Orson Welles' Mercury Theater. When Welles filmed Citizen Kane, he took Herrmann to work with him. Even after winning the Academy Award Herrmann kept his "regular job" with CBS for as long as the radio network had its own orchestra and needed a supply of music on a constant basis. Thereafter, he did some other work for the network. Part of his job included writing "stock music" for the network's music library, all-purpose cues that could be pulled out and played, or even simply inserted from recordings, literally on a moment's notice. Later Herrmann arranged some of this stock music into suites: Western Suite, The Desert Suite, and Outer Space Suite. These are all-purpose cues for television series, written from 1956 to 1959. Outer Space Suite is for woodwinds, harp, and percussion, mostly bell-like. Most parts of its music appeared in episodes of Rod Serling's The Twilight Zone. One notable use was in People are Alike all Over, written by Serling after a story by Paul Fairman, starring Roddy McDowell, who finds that Martians are distressingly like humans, particularly in their propensity to put other species in a zoo." It appeared on an album in 1983, and has never been issued on CD. Bernard Herrmann: "Outer Space Suite"
It's a durn shame that the ellipsis arts label has gone under. They produced some stellar book/CD packages. 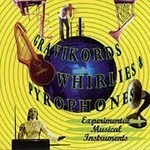 And tho I can't give you the color-illustrated book, I can give you the CD of home-made mad-genius musical instrument inventors "Gravikords, Whirlies & Pyrophones." Compiled by Bart Hopkins, publisher of a magazine dedicated to experimental instruments, with a forward by Tom Waits, "Gravikords" is a crucial document of strange music. It's a great listen, from legends like Clara Rockmore's classical theremin, to Sugar Belly's bamboo-sax calypso, to Wendy Chamber's version of "New York New York" on the car-horn organ (which is exactly what you think it is). Covering both the semi-famous (Harry Partch, Don Buchla & Robert Moog) as well as unknown toolshed tinkers, it's an inspiring testimony to human ingenuity and imagination. THE AVENGERS & Other Top Sixties TV Themes (disk 2) .